A Girl and Her Scout: Artist Highlight of the Week: Everthing and GIVEAWAY! Artist Highlight of the Week: Everthing and GIVEAWAY! So I have an obsession and it's called amigurumi. I plan on learning to crochet (and have already started practicing) just so I can make these cute little Japanese-inspired creatures. 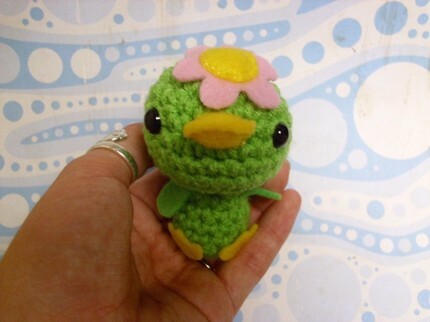 It just so happens that this week, our artist highlight, Everthing, makes some of the CUTEST amigurumi I have ever seen (and I have seen a lot)! They are so fabulous! This week as my artist highlight of the week, Everthing is offering a discount and a special little gift for her amigurumi and a GIVEAWAY on some of her awesome earrings! Hey Everthing! Welcome! 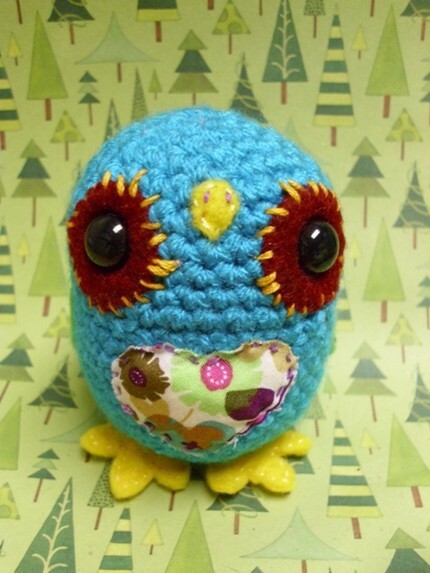 Tell us a little bit about yourself and your fabulous amigurumi and other crafts. Well I live in Louisville. I am a mother of a super little boy, named Sylar, who wants nothing to do with my amigurumis. They don’t make noise or have fancy lights, and for an 8 month old boy I am sure that is a big deal. 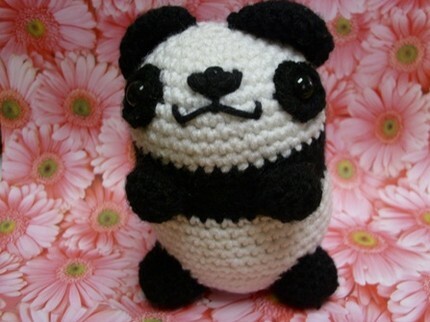 So I really can’t say that I crochet for him. I Live with Sylar, my fiancé Josh and our two cats, rat and a red tail boa. So it is quite the menagerie at our house. I work at Puleo’s Grille as a server, and I love it. I love having a job where I go in, make my rent and bills, then go home to my family and get to relax with some Dexter or Mad Men while I crochet or sew. I am a habitual crafter who sneaks away to Hobby Lobby at any chance her boyfriend is not looking. I love trying something new, mastering it, and then moving on to something else. I can’t help it. I have to constantly be stimulated and I am paying the price for it. My wrists and hands are quite banged up from everything. 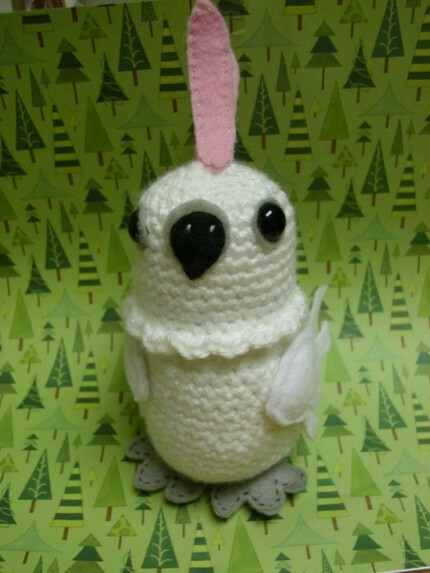 Besides the amigurumi you have in your Etsy store, what else do you like to do? In a sense, anything. If it is crafty I love to do it. I paint. Portraits are my favorite. I love the challenge of matching someone’s likeness. But I hate commissioned paintings for people because I feel like there is no passion behind them, it has to come to me. I do regular crocheting (scarves and hats and things,) jewelry making, sewing, writing, drawing, wood burning, sculpting and dreaming up story lines involving zombie survival and strange steampunk lifestyles. What first drew you to crocheting? Well I was taught by my mother when I was 6 how to make a chain. My mother used to crochet when she was my age and actually has some finished projects somewhere out there now. But for years all I knew how to do was a chain and then slip stitches, it wasn’t until I was 15 that I actually started getting serious about it. My mother bought me an encyclopedia of crochet at a liquidation sale and I quickly began teaching myself how to make all the different stitches. It came to me easily and it was fun because I was working in another dimension other than drawing or painting. I was creating something functional rather than a piece of wall art. When I was 19 I fumbled onto amigurumi. 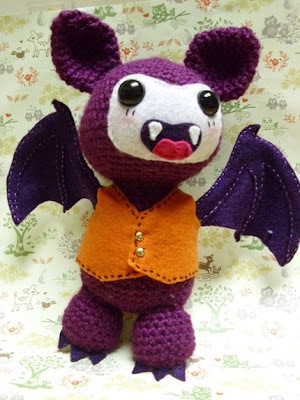 I had essentially put down crocheting because I was bored with it, but I remember reading an issue of Entertaiment Weekly and they were featuring a book on how to make your own little creepy critters for Halloween. I wanted to do that so I searched hi and low for that book and happened to run across Anna Paula Rimoli’s Amigurumi World: Seriously Cute Crochet instead. (She is an Etsy seller!) I chose this book with the thought that I could just apply the same rules to those other critters in the back of that EW. And it was full speed ahead. I made 9 amis in my first week. Granted, they were loosely crocheted and a little lacking, but we all start somewhere. I used to take my things I had made into my art class every Friday morning and my teacher introduced me to Etsy. I waited until I was comfortable with what I was doing (2 years)before I made a page. I wasn’t about to put something out there that I wasn’t 100% about, but now it was the right decision to make and I am proud of myself. I now have validation for all the yarn that I have bought over the past two years… and that is quite a bit. I am inspired by color, music, movies, books, animals, Marvel Comics, you name it. I can honestly look at a Skeen of yarn and just imagine the creatures coming out of it. I am enjoying birds right now. I just sold a couple of conjures that I crocheted and I miss them very much. I didn’t give them a proper goodbye. Music is a big part of my life because it makes me expand my mind. I am such a visual person that the music, although I cannot see it, I can envision it or put some sort of image to it. Right now I am listening to a lot of Daft Punk, DeadMau5, Lady Gaga and other dance artists. 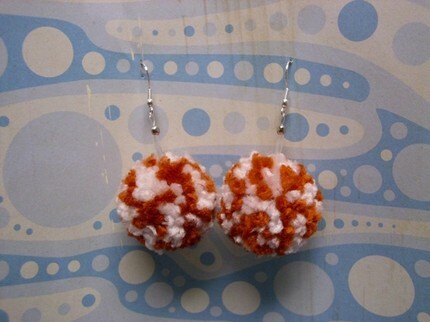 As you can see I have earrings that were inspired by Deadmau5. I love my weekly TV shows, True Blood, Dexter, Mad Men, but they and the books I read affect me in a way that is different than I show in my crochet projects. The writer and painter in me has a darker perspective than the crafter. It is like a split personality thing, and although it keeps people guessing as to what I am going to do next, it becomes quite the burden because I do want to appease everything in my creative psyche. Look at me the tortured artist. LOL! Amigurumi lets me access the little girl in me. My favorite thing to do is to go to my little search engine box and type in the word “kawaii.” It is Japanese for “cute” and the image results are endless and so fun. Aside from success doesn’t happen overnight, remember that you are new to the game. Sure you can do whatever to get your name and page out there but you need to be accessible to people. Don’t go overpricing anything and don’t seem pretentious. It is a huge turn off to a lot of people, but possess confidence and knowledge of your craft, people do like that. Be involved too. One thing I found out is that most people on Etsy are friendly and willing to help and communicate with you. The more you are out there in the Etsy community, the more hits your page will get and the more items you are likely to sell. Keep Positive and Happy Crafting! from her shop in the color of your choice to the chosen winner (chosen via a random assorter) on Oct 12th so be sure to get in your entries by then! To enter, head over to her Etsy Store, Everthing, and leave a comment here about your favorite item(s). Additional entries for: 1) becoming a first time follower of A Girl and Her Scout 2) Posting this giveaway with a link to my blog on your blog 3) Posting this giveaway with a link to my blog on your facebook and/or twitter 4) “Hearting” or adding Everthing to your “Favorites” on Etsy and/or 5) making a purchase out of her store (one entry for every purchase). Be sure to leave a new comment for each additional entry! In addition, through Oct. 12th she will be offering a 20% off discount any of her amigurumi plus a free accessory for your amigurumi when ordered to all A Girl and Her Scout readers! YAY!!! Just use key word “KnoxAmis” at check out by messaging the seller to receive your discount. It will be refunded to you through paypal after making the purchase. Happy shopping and crafting and many thanks again to Everthing for participating in my Artist Highlight of the week! I love Bill the Pig! Hard to choose among all the cute critters. I really like the little owl! It is darling! Sounds like a wonderful Valentine's gift and I hope you and Andrew have a terrific time.